Easy access to your vehicle’ s roof! Use the Rightline Gear Moki Door Step to load and strap down car top cargo bags and boxes; canoes, kayaks, and SUPs; skis and snowboards; and bikes. Even use it to help wash your vehicle’ s roof. 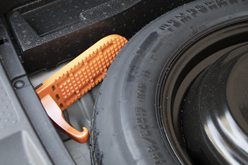 The Door Step is universal to all vehicles and works in both the front and rear doors. 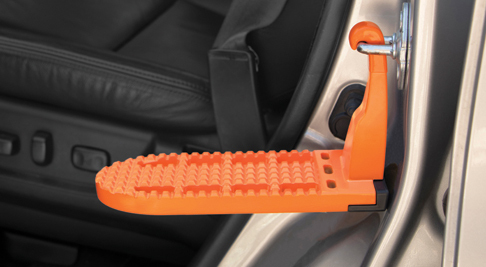 Simply hook the Step over one of the vehicle’s u-shaped door latches. 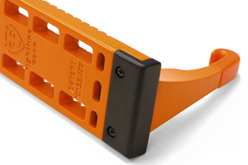 The Step’s rubber bumper and coated hook protect your vehicle’s door frame. Store the Step in your vehicle’s center console, glove box, or spare tire compartment when not in use. The Moki Door Step provides a comfortable platform for both feet and allows for a balanced standing position. 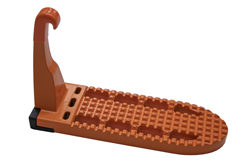 The patented Step eliminates dirty shoes on vehicle seats and the need for step stools or ladders. If you are short or your vehicle is tall; the Moki Door Step makes getting your gear on or off your roof a breeze!